^ "Bosphorus (i.e. Bosporus), View from Kuleli, Constantinople, Turkey". World Digital Library. 1890–1900. Retrieved 12 December 2013. ^ "Byzantium: A Tale of Three Cities - BBC Four". BBC. Retrieved 9 April 2017. ^ "Milliyet İnternet - Pazar". Milliyet.com.tr. 19 December 2004. Retrieved 9 April 2017. ^ "washingtonpost.com: Constantinople: City of the World's Desire, 1453-1924". www.washingtonpost.com. Retrieved 9 April 2017. ^ Crowley, Roger (6 August 2009). 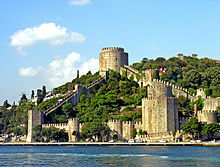 Constantinople: The Last Great Siege, 1453. Faber & Faber. ISBN 9780571250790. ^ "Gennadios II Scholarios | patriarch of Constantinople". Encyclopedia Britannica. Retrieved 9 April 2017. ^ "List of Ecumenical Patriarchs - The Ecumenical Patriarchate". www.patriarchate.org. Retrieved 9 April 2017. ^ Miller, William (1896). The Balkans: Roumania, Bulgaria, Servia, and Montenegro. London: G.P. Putnam's Sons. Retrieved 8 February 2011. 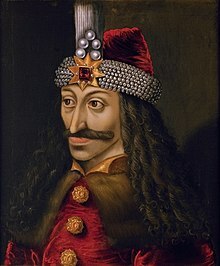 ^ a b "Vlad the Impaler second rule ". Exploringromania.com. Archived from the original on 8 June 2009. Retrieved 17 August 2012. 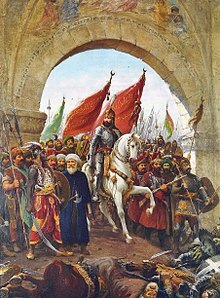 ^ "1474 | George Merula: The Siege of Shkodra". Albanianhistory.net. Archived from the original on 5 October 2013. Retrieved 17 September 2013. ^ "Karamanogullari Beyligi". Enfal.de. Retrieved 17 September 2013. ^ "Soldier Khan". Avalanchepress.com. Retrieved 17 September 2013. 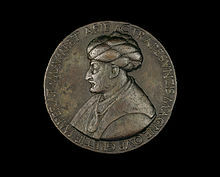 ^ "Mehmed II | Bellini, Gentile | V&A Search the Collections". collections.vam.ac.uk. Retrieved 9 April 2017. 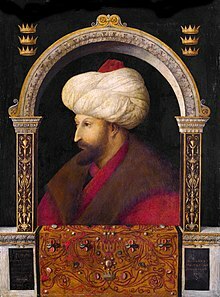 ^ "Gentile Bellini | The Sultan Mehmet II | NG3099 | National Gallery, London". www.nationalgallery.org.uk. Retrieved 9 April 2017. ^ "Croatia and Ottoman Empire, Ahdnama, Sultan Mehmet II". Croatianhistory.net. Retrieved 17 September 2013. ^ "A Culture of Peaceful Coexistence: The Ottoman Turkish Example; by Prof. Dr. Ekmeleddin IHSANOGLU". Light Millennium. Retrieved 17 September 2013. ^ sitesi, milliyet.com.tr Türkiye'nin lider haber. "Fatih, Hakan ve Roma Kayzeri | İlber Ortaylı | Milliyet.com.tr". MİLLİYET HABER - TÜRKİYE'NİN HABER SİTESİ. Retrieved 9 April 2017. 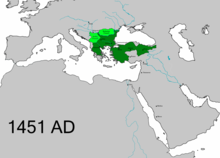 ^ "Europe and the Turks: The Civilization of the Ottoman Empire | History Today". www.historytoday.com. Retrieved 9 April 2017. ^ "Memlûkler". Güncel Kaynağın Merkezi (in Turkish). 6 January 2015. Retrieved 9 April 2017. ^ Heywood, Colin (2009). 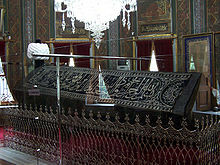 "Mehmed II". In Ágoston, Gábor; Bruce Masters (eds.). Encyclopedia of the Ottoman Empire. p. 368.